Vornado is known for their energy technology, starting with fans and circulators and later entering into the market with humidifiers. The brand is the brainchild of aerodynamic and energy efficient design, created over the course of three decades and changing the industry of home comfort. The company’s products have been well received since the 1940s, and their humidifiers are no different. The best Vornado humidifiers provide innovative design and technology so that you stay comfortable in your home as well as feel like the devices blend into the surroundings instead of creating an eyesore. With the way Vornado has worked to create the optimum design to keep the air in your home moist and comfortable, how do you choose the best Vornado humidifier for your house or room? First, you have to know more about the company, as well as the construction of their humidifiers. Then, you can make a more informed decision as to which product will please you most. 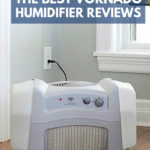 What Makes the Best Vornado Humidifiers the Best? Can You Put Essential Oils in a Humidifier? How Often Do You Change a Humidifier Filter?